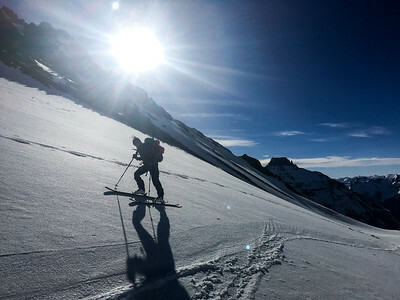 After missing one of Colorado’s better ski seasons this winter, I returned from Finland to receive an invite to head to the SW corner of the state, where the snow is nearly always abundant, for a spring ski trip. It’s a long drive, but it’s usually totally worth it. 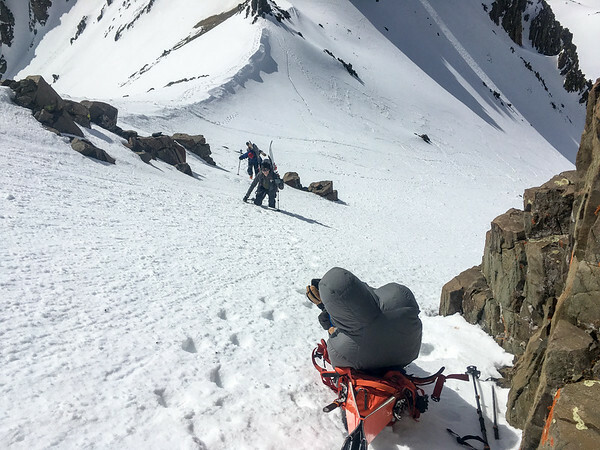 With standard work schedules pushing our departure back to Friday afternoon, we arrived at the base of Sneffels around 11pm and bivouacked between the cars. We weren’t in a huge rush in the morning considering it was still pretty cold and the wind would keep the snow from softening up much. Besides, our stove system didn’t cope well in the morning wind and it took a while for the water to boil. The approach started up a mellow slope into Yankee Boy Basin and once we made the first major crest we foolishly routed ourselves on an awkward traverse in hopes of saving some elevation gain. The snow was still very firm and we had to work hard to keep our edges in the slope with the skins still on. Then, just before Blue Lake Pass, we made a sharp right turn to head due north and straight up a couloir that pushed 45-50 degrees in spots. 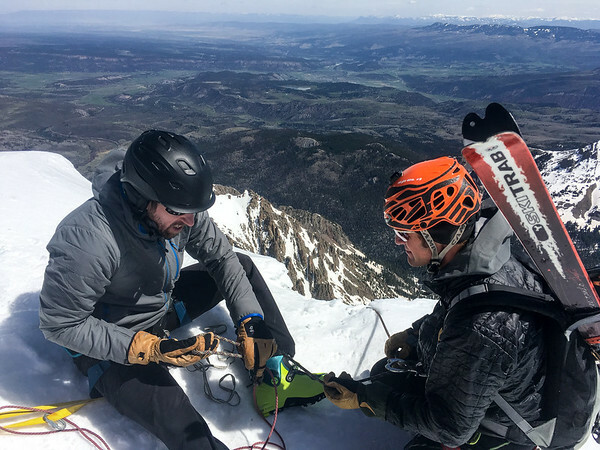 The skis came off and we were bootpacking from there to the 14,150′ summit of Sneffels. We weren’t alone up there. Aside from the four of us, There was a party of three ahead of us, another party of three behind us and a few groups of two, some coming from the north. We caught the group in front of us and helped them with the rappel down into the top of Snake Couloir and that gave the group of three behind us a chance to catch us and we let them play through. After nearly six hours of climbing it was finally time to ski. Below the 60m rappel, the top of the couloir was still pretty steep and it took some stomping around to gain a shelf where skies could be put on. Once we were all mostly ready, I started down and worked up my nerve to make a few turns down this 50+ degree slope. I never warmed up to any tele-turns on the upper section of the couloir even though the snow was in really good condition. It was that perfect balance between firm and soft where my edges easally held without the snow being too heavy. 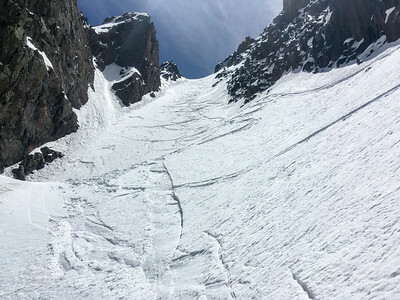 The crux of this ski was a 20′ section that narrowed down to about 8 feet wide before getting to the lower slope of the couloir where I finally warmed up to dropping my knee for most of my turns. That felt really good especially after having not really skied all season. Now on the north side of Sneffels in the upper reaches of Blaine Basin we stopped for a quick snack where we gained a small blip of cellular service to text home that all was well. We then put our skins back on and started the 1,000 foot climb, back to 13,000′ to crest the ridge that put us back on the south side of the mountain. By now we were well into the afternoon and despite the constant wind the snow had softened significantly. After each turn down this gentle slope back to the car the snow got softer and wetter until it was like we were pushing though mashed potatoes. The wind had died down and we were able to bare our chests to the warm sun as we loaded up the cars and had a celebratory drink before heading down the mountain to soak in the hot springs of Ouray, Colorado. This entry is filed under: Blog, North America, Ski, Snow, Story, Video.